In one month I’ll be in Malta, a tiny country most people have never heard of. Here is a representative sampling of travel books available in the library for the three countries I’ll be visiting: Italy, Spain, and Malta. 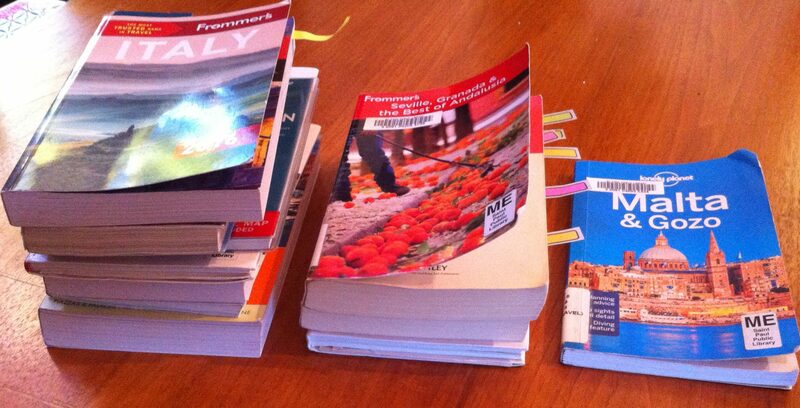 There was a whole shelf of books about Italy, a half shelf for Spain, and one slim volume about Malta. This should have told me something about what a hot (not) tourist destination Malta is. But once I get something fired up in my imagination, there’s usually no turning back. Of course Vatican City is technically a country—the smallest in the world. I’ll be visiting the Basilica of St. Peter and the Vatican Museum and I’m sure there are entire books about them, but I don’t need books to tell me I’ll be seeing a lot of paintings of the Virgin Mary and baby Jesus. Someone at work laughed about me going to Malta and suggested that since I would also be visiting Vatican City, I could make this a grand tour of tiny countries. You know, the ones that send one athlete to the Olympics—an athlete who doesn’t stand a chance? I could have gone to San Marino, which is surrounded by Italy; and Monaco, which is on my bucket list. Liechtenstein would be a bit further north in Europe, but not as far as the other five that round out the Top 10 List of tiny countries, which are all tropical islands: Nauru, Tuvalu, Saint Kitts and Nevis, Maldives, and Grenada. The lack of interest in Malta may have something to do with how difficult it is to get there. I will be leaving from Sorrento, where I will have spent three days seeing Pompeii, the Amalfi Coast, and Capri. You would think, from reading the one book about Malta, that you could just hop a train to Naples and fly right to Malta. Boom—easy! But alas, this was the same book that told me I must see the underground, 5,000-year-old catacombs on Malta, the ones that are closed for renovation until 2017. The book also said it would be “easy” to take a ferry from Italy to Malta. However I need to get to Madrid afterwards and it would take two days to get to the coast of Spain by ferry. All the flights from Naples left at either 6:00 in the morning or 4:00 in the afternoon. They all connected somewhere else, which meant that reasonable-sounding 4:00 p.m. flight would get me into Malta at 11:30 at night. And the 6:00 a.m. flights were much faster; I seriously considered one that had a 6-hour layover in Paris. Finally, I decided to fly from Rome. 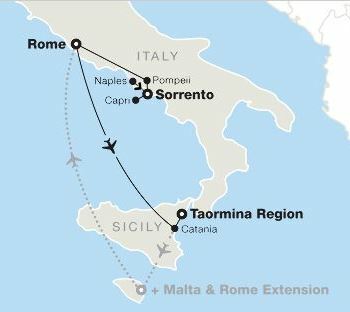 This will require me to get up early—but not quite as early as the 6:00 a.m. flight—catch a train to Naples, then connect to Rome, then catch the express to the Rome airport, then fly at 11:00 a.m. to Catania—which is on Sicily, then finally arrive on Malta at 3:30 in the afternoon. That is, if nothing goes wrong on any of the five legs of the journey. Another puzzle has to do with baggage. The flights to and from Malta are cheap—if I am willing to travel with only a carry-on bag weighing no more than 22 pounds. I spend some time researching ultra light bags; I could get a nice one for $70. Or I could just pay RyanAir $75 for the privilege of bringing a real suitcase with me. I toy with the idea of traveling light. It would be easier to get on and off all the trains and buses and planes. I’d be less conspicuous, since my regular suitcase is purple. It could be kind of a cool challenge to wear only two outfits for a month, to say “no” to buying clothes in Italy, and eschewing souvenirs. Plus I would be doing my small part to save the planet! Nah. I’ll bring my purple monster. I like to have options. I contemplate these “problems” knowing that countless refugees are attempting the crossing to Italy in rubber rafts before the sea gets too rough in November. This entry was posted in Adventure, Budget travel, International Development, Travel and tagged Italy, Malta, Spain, travel on October 9, 2016 by Breaking Free.